Well, if you remember from a few posts ago, I completed my mockup undergarments and exterior garments for this 1903 look in muslin (the same fabric I used for the 1883 and 1913 mockups). But now I’ve completed first fittings for my garments in their actual fabrics! Let’s start at the outside and work our way in. 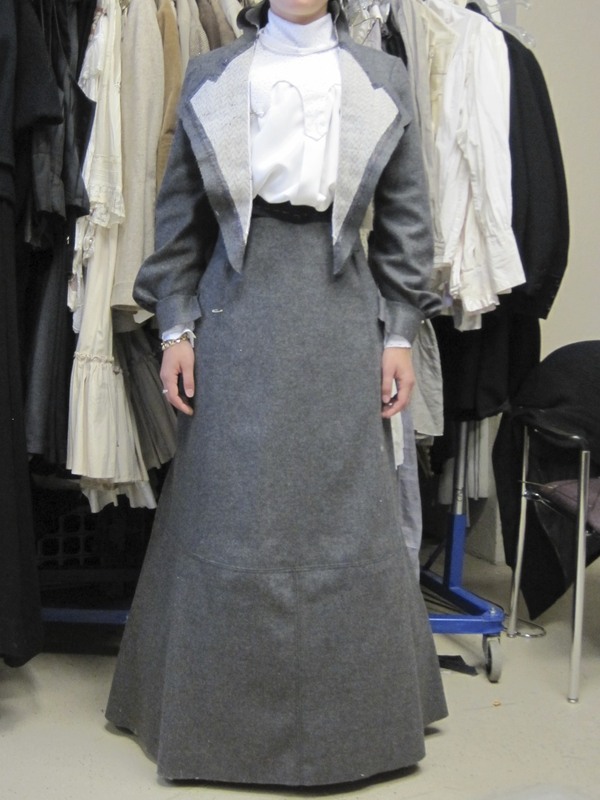 The exterior “suit” is two pieces: a jacket and walking skirt. Both layers are constructed of fairly heavy wool, so tightly woven it is almost like melton. Melton is a felted wool frequently used for outerwear and constantly used historically for it’s water resistance and ability not to fray–thus allowing tailors to leave their cut edges raw and not finish them with time intensive seam finishes. The walking skirt is intended for use out of doors: specifically for talking walks (hence the name) and promenading about in the public eye. Under the jacket is a silk crepe blouse with a lace yoke, collar, and cuffs. If you look closely you can see the three points of the lace yoke on the blouse. The blouse is pulled off-center in this picture because of the alterations I needed to make-only one side has the alterations pinned. Under the skirt there is a cream colored lace edged silk shantung petticoat. The petticoat has two circular, gathered ruffles at the bottom. The top ruffle has a wavy hem edged in lace and the bottom ruffle is edged in matching lace. There are also arches of lace above the ruffles. There is also a cream colored corset cover that is not pictured in these photos. This s-shape corset is made of green silk shantung flat lined with coutil. The seams are flat felled on the inside. The edges are bound in bias cut shantung and the top is also edged with white lace threaded with pink silk ribbon. Under the corset is a cotton combination that buttons up the front. A combination is an undergarment that is functions as a chemise but has bifurcated leg openings, like drawers. This pair is edged in white lace at the leg openings and neck edge. 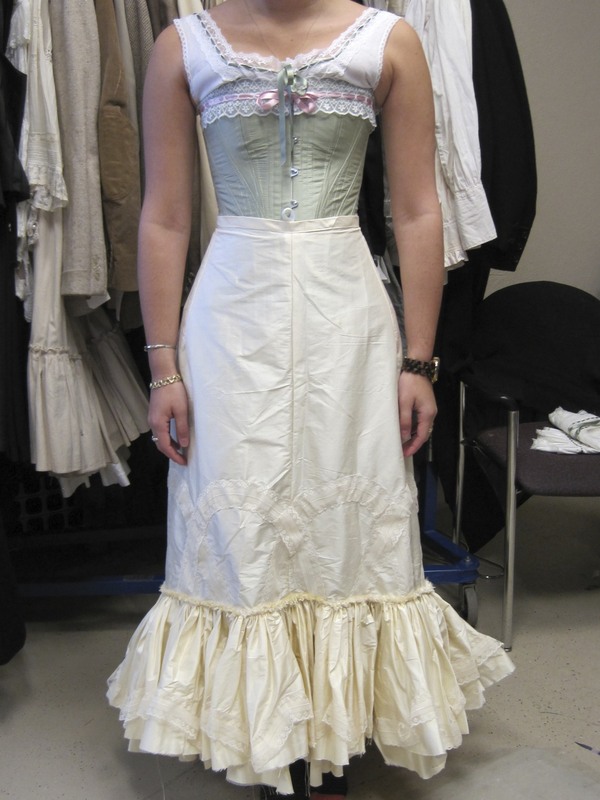 The neck opening is threaded with a green silk ribbon to coordinate with the corset. This entry was posted in 1900s, 20th Century, Corsets, Costume Construction, Edwardian Clothing, Fittings, Project Journal: Victorian Women's Tailoring, Social History, Tailoring, Undergarments, Victorian Clothing and tagged 1900s, Chemise, Corset, Cotton, Coutil, Edwardian, Fittings, Lace, Petticoats, Ribbon, Ruffles, Silk, Skirt, Tailored Clothing, Undergarments, Victorian, Women's Clothing, Wool. Bookmark the permalink.